(VEN) - The Ministry of Science and Technology in collaboration with the French Development Agency has officially launched the French government-funded project to support geographical indication development in Vietnam. This project aims to improve domestic geographical indication registration and management systems on the basis of lessons learned from European countries, especially France, in a move towards the integration of registration and management of geographical indications to other countries in the region and around the world. According to Deputy Minister of Science and Technology Tran Viet Thanh, Vietnam still faces many difficulties in geographical indications and there are few products with geographical indications in the market, which have failed to create a distinction from those without geographical indications for consumer recognition. So, geographical indications should be more strictly considered as a tool to protect the value of agricultural products and momentum for sustainable trade development. There are two directions for agricultural development in the world, one moving towards global practice while the other towards local practice. Large-scale agricultural sectors often follow the first direction while small-scale agricultural sectors usually take the second and focus more on product quality than quantity. Vietnam is appropriate for the second choice, taking the French example. It is expected that this project will lay a corner-stone for the domestic agricultural restructuring process, improving the value added to agricultural products, said Vu Trong Binh, the Head of the Central Economic Committee’s Local Economy Department. 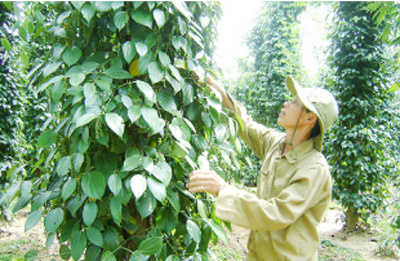 Quang Tri and Binh Phuoc provinces will be the first to pilot the project on the two agricultural key products, pepper and cashew respectively. “Quang Tri which boasts pepper products and is willing to expand its production area, improve quality and promote branding is ready to learn geological indication experience from French partners,” said Director of the Quang Tri Department of Science and Technology Tran Ngoc Lam. According to Vo Thanh Hai, the Head of the Intellectual Property Office under the Binh Phuoc Department of Science and Technology, 266 cashew production and processing enterprises in the province annually produce 200,000 tonnes of cashew nuts. However, only 45 of which have been able to directly export cashew nuts. So, piloting the project will help the province to improve cashew nut quality and promote branding at home and abroad. Nearly US$1.3 million is scheduled for the implementation of the project to support geographical indication development in Vietnam, including US$1.1 million funded by the French Development Agency. This three-year project is expected to significantly contribute to Vietnam’s geographical indication development.